England boss Roy Hodgson will not be given a new deal until after Euro 2016 to avoid the "unsavoury position" that emerged under Italian Fabio Capello, the Football Association has said. Capello, then the England manager, signed a new contract prior to the 2010 World Cup, but England lost to Germany in the second round. "Roy is very comfortable with the situation," said FA chief Martin Glenn. Hodgson's current contract runs out after Euro 2016. In July, Glenn said Hodgson would be the last person to "ask for a contract extension" if he did not do well. 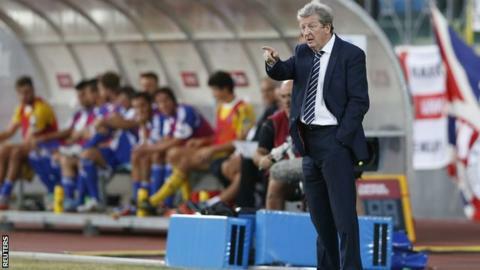 Under Hodgson England have won all eight games in their qualifying group for the tournament in France next year. At the 2014 World Cup, however, they went out in the group stage without winning a game. Speaking at the Soccerex conference in Manchester, Glenn also talked about England's image within the global game. "The FA, being football's first governing body, is 'the ultimate expression of arrogance'," he said. "What's seen to be the case, we get interested in the international game when it suits our purposes; to host a World Cup.